We’re back and in full force! Chapter 4.7 of the Deep Fried Bets Podcast is here and we’re breaking down all the action for Week 7 of the College Football Season and Week 6 of the NFL Season. We’re joined this week by Peter Burns of ESPN and SEC Network to break down some Week 7 College Football! We’ve got all the winners you could ever need so check them out and spread the good word! You’re friends will thank you for it, we promise! We’re a little delayed but we’re finally here with Chapter 4.5 of the Deep Fried Bets Podcast! We’ve got all the winners you could ever need for Week 5 of the College Football Season and Week 4 of the NFL Season! We’re joined by Max Meyer of Sports Illustrated Gambling to break down some College Football Action! Check us out and let your friends know about all the money you’ll be making! Blake and Boomer are back for Chapter 4.3 of the Deep Fried Bets Podcast! We’re joined this week by Dan Rubenstein of Solid Verbal! We’re breaking down Week 3 of the College Football Season and Week 2 of the NFL. We’re both coming off winning weekends and the winners are going to keep on coming this weekend! Be sure to subscribe/rate/review on iTunes if you haven’t already! Blake and Boomer are back for Chapter 4.2 of the Deep Fried Bets Podcast! We're here to break down Week 2 of the College Football Season as well as take a deep dive into the upcoming NFL Season and take a look at some of the Week 1 action! We're joined this week by College Football Aficionado Laura Rutledge of ESPN and SEC Nation, as well as Gambling Expert David Purdum from ESPN Chalk! Be sure to subscribe on iTunes and Rate and Review! Please share the good word and enjoy all of the winners! We're back after wayyyyyy too long of a layoff! 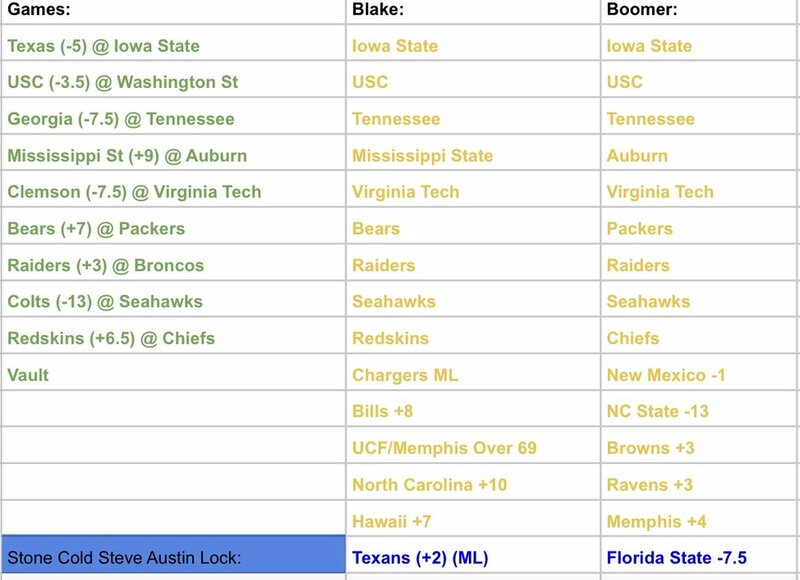 Blake and Boomer are here to handicap the upcoming College Football Season as well as pick all of the biggest week 1 matchups and some off the board love as well! Chapter 3.12 of the Deep Fried Bets Podcast! We're back with Jay Donnell from Atlanta Sports Daily and Boomer and Blake are breaking down all of bowl season! We've got the first wave of games for you this week then we'll keep bringing them to you over the coming weeks! It’s time to eat my friends! Turkey Day and Rivalry Week, there’s money to be made all around. So there won’t be a podcast this week, I planned on doing one tonight but got hit with some last minute family stuff. Anyways, I know everyone is super busy so let’s get right to the picks. We’ve got three NFL games on Thanksgiving Day and one pretty good College Football Game. Then we have a phenomenal slate of College Football on Saturday that we’ve got some winners for. Us versus your bookie this weekend! Week 11 of the College Football Season and Week 10 of the NFL Season are here, and we've got all the winners you could ever need! It's going to be the best weekend yet, come join in on the winning! Deep Fried Bets Podcast Chapter 3.8! Blake and Boomer are back for all of your weekly winners! This week we're joined by Peter Burns from ESPN and the SEC Network to preview some week 8 College Football matchups! We're also breaking down some week 7 NFL games, and I've got updated results as well as my updated Twitter Picks (spoiler alert: they're really really good). Blake and Boomer are back for Chapter 3.5 of the Deep Fried Bets Podcast! It's week 5 of the College Football Season and Week 4 of the NFL Season, and we've got it all covered. No there will be no anthem talk. We're joined by Brett Ciancia, who's the Co-Owner of Pick Six Previews to help us break down Week 5 of the College Football Season. Brett's got some winners for us too! We're also checking out week 4 of the NFL and giving you plenty of winners there. We're both finally over .500 for the year on official picks and have every intention of staying there. Check out the picks here! Be sure to subscribe on iTunes if you don't already! Blake and Boomer are back for Chapter 3.5 of the Deep Fried Bets Podcast! We've got week 4 action in College Football and we've got several winners from Week 3 of the NFL season. We're joined by Aaron Kessler, who is an oddsmaker at the Golden Nugget in Las Vegas! Check out our past picks, and picks form this week here!